From the time I first learned in May or June of 2010 that our Garn ancestors came from the village of Kürnbach, Germany, I wanted to visit Europe and especially the village of Kürnbach. I spoke with my brother Stan, who had lived in Germany for seven years. He wanted to visit also. And one of the places he wanted to visit was Paris. He had visited Paris a few times. I had visited quite a few times as part of a NATO research group to which I belonged years ago when I was working. I also visited with my family during the early 1990s. So Stan and I included Paris on our itinerary. When planning our trip, we decided to fly into Paris and return from Frankfurt, Germany. Our flight left Dulles Airport in the late afternoon, which got us into Paris in the early morning. Having made a number of overnight flights to Europe, I must say that I prefer the flights that leave later in the evening and arrive later in the morning. It seems as though sleeping on the flight is easier when the flight leaves later in the evening. We arrived at Charles de Gaulle Airport early the morning of 13 September 2012 and caught a train to Gare du Nord, one of five train stations in Paris. There we found the Paris Metro station inside the train station and headed toward the Ballard Metro Stop, which was right across the street from our hotel. At our hotel we discovered that our rooms were available. I was quite surprised by this since it was around 9am in the morning. After cleaning up, we headed out to see Paris. Our first goal was to see the Eiffel Tower. 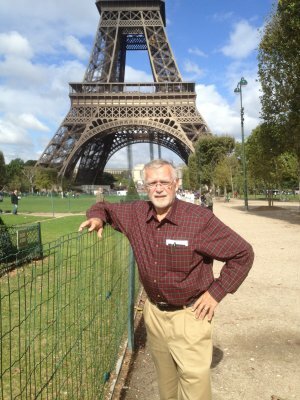 The picture below shows me at the Eifel Tower. We walked under the Eiffel Tower but did not attempt to go up it. There was a huge line waiting to take the elevator to the top. And we were not interested in standing in line. 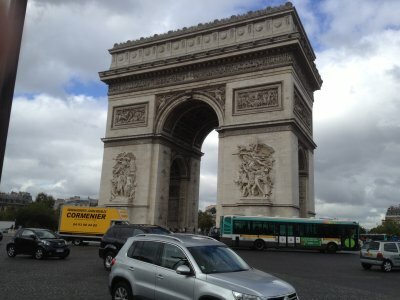 After looking around the Eiffel Tower we headed off to see the Arc de Triomphe, a must for all visitors to Paris. 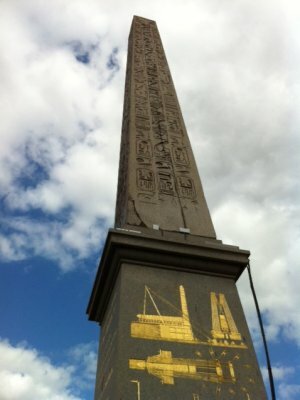 We walked the length of the Avenue des Champs-Élysées and visited Place de la Concorde where we saw the Obelisk of Luxor, which is more than 3000 years old and was placed in the middle of place de la Concorde in 1836. It was originally inside the Temple of Thebes. The picture below shows the obelisk. 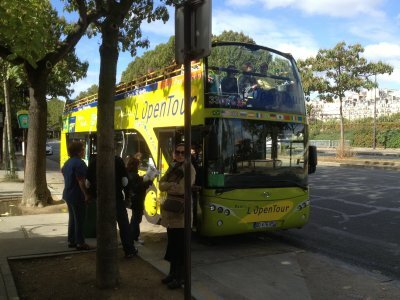 While we were walking around Paris, we saw several of these tour buses like the one shown below. I had to take a picture of one of them because my daughter, Barbara, worked as a tour guide on the Tour Mobile, in Washington, DC, one summer while she was in college. The Paris tour bus reminded me of the buses on which my daughter gave her talks about Washington, DC, to tourists. We did not take the tour bus in Paris. 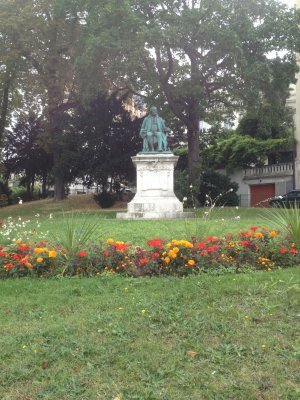 Benjamin Franklin was loved and revered in France. There are streets named after him in several cities including Paris. He was a respected scientist, inventor, statesman and diplomat. The American colonies undoubtedly had a reputation for being a bit rough and unsophistocated to the French at the time Franklin was living. And Benjamin Franklin clearly didn't fit that sterotype. So the French loved him. He made several visits to France and served as the United States Ambassador to France for about nine years. The French erected the statue shown below in honor of Benjamin Franklin. 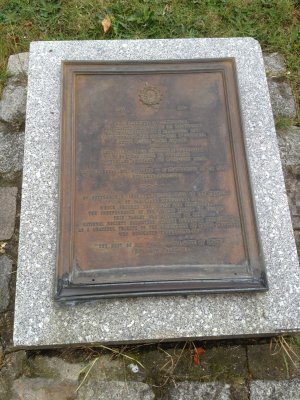 The plaque in the photo below was later placed near the statue. 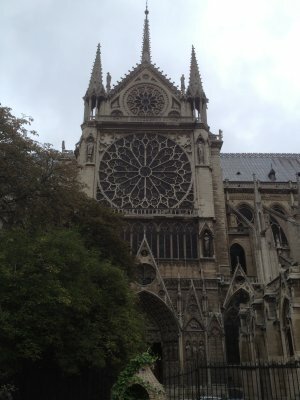 Notre Dame Cathedral is a must for visitors to Paris. 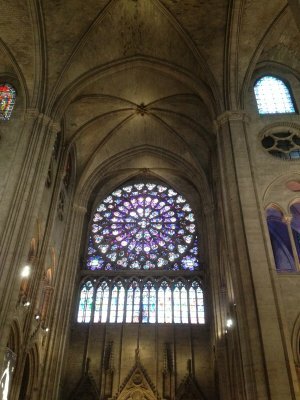 The pictures below show the side of the Cathedral and a stained glass window from the inside. 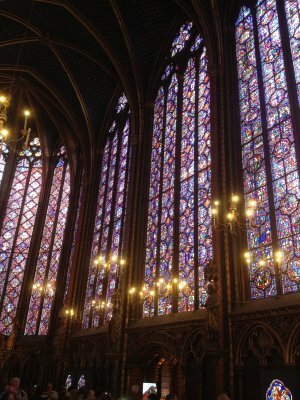 Near the Notre Dame Cathedral is Sainte-Chapelle, a smaller chapel with beautiful stained glass windows. Although some of the window panels at Sainte-Chapelle were being renovated, there were plenty that had either already been renovated or were still uncovered and visible to tourists. It was while we were standing in a long line waiting to get into Sainte-Chapelle that we considered going somewhere and buying canes. Neither of us is anywhere near needing a cane. However, we noticed lots of people with canes who approached the line and were shuffled to the head of the line by the guards at the entrance to Sainte-Chapelle. No doubt most of them really needed those canes. But we suspected that some used them to cut in line. The picture below shows a view from inside Sainte-Chapelle. Another well-known church in Paris is Sacre Coeur, which is located high on a hill inside and overlooking the city. Our visit to Sacre Coeur included a hike up the hill from the nearest Metro station. 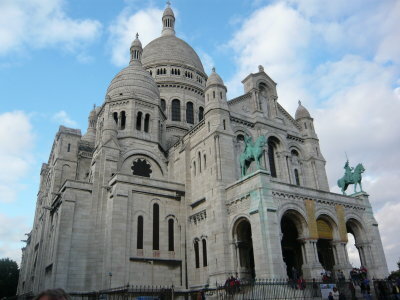 The photo below is a view of Sacre-Coeur. One very interesting place we visited in Paris was Invalides. It was originally sort of a hospital for military veterans or invalids of French wars. It is now a military museum and houses the tomb of Napoleon. 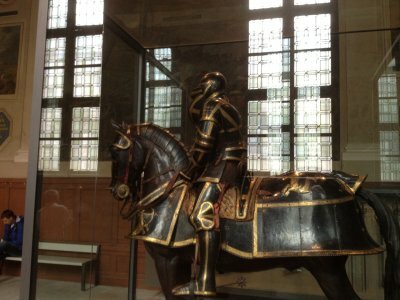 The photo below shows some of the armor in the military museum which was worn by French knights. 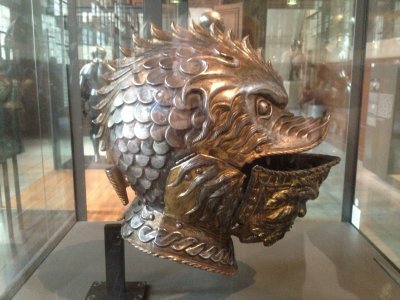 The military museum had lots lances, swords, and sets of armor for knights including many examples of strange and ornate helmets for the knights like the one shown below. 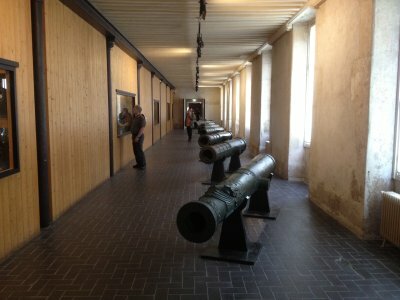 The military museum had lots of cannons on display like the ones in the photo below. 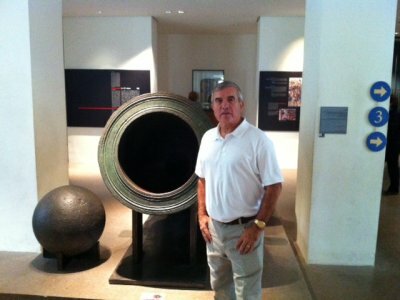 The pictures below show Stan and me standing beside one of the large cannons. There were others with higher caliber. 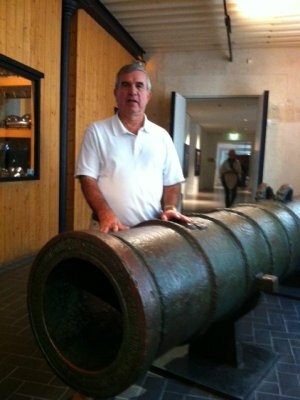 The pictures below shows Stan standing beside a very large caliber cannon. The diameter of the barrel was probably 18 inches. I had first visited the military museum around 1983 when I was on a business trip. About eight years later, I took my family to Paris for a vacation and visited the military museum at that time also. 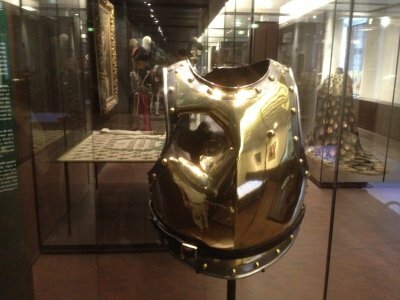 On both of my previous visits to Invalides I saw a set of armor like the one below with a small bullet hole, about half an inch in diameter. Stan had never been to the museum. So I wanted to be sure he saw the armor with the small bullet hole in it. The guards did not speak English. But I kept asking each guard we came upon in my best French where we could find the armor with the bullet hole in it. Each guard pointed down the hall, up the stairs, or through some room making me think we hadn't communicated our destination accurately. Imagine my surprise when we rounded the corner and saw the armor below that had been blown through by a large ball. This piece of armor definitely was not on display the two previous times I'd visited the museum. Upon seeing the pierced armor, Stan remarked that he bet the guy inside the armor was already dead by the time the ball exited the back of the armor. 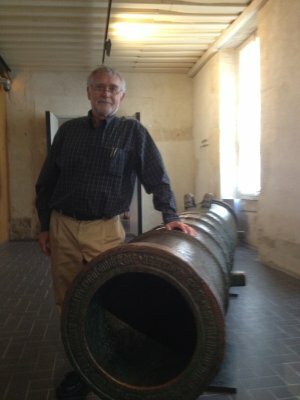 I like to think of it as a good example of the introduction of modern cannons to ancient armor. 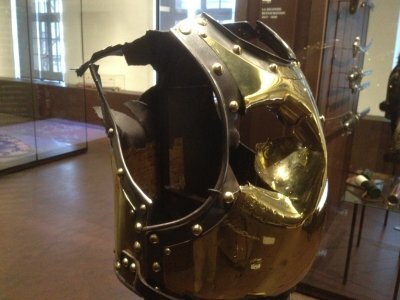 This is a side view of the armor that was pierced by the large ball. 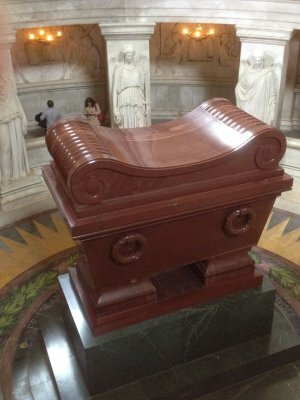 Also located at Invalides is the tomb of Napoleon, which we visited. Napoleon is still revered in France, undoubtedly because he symbolizes the times when France had more influence in the world. The picture on the left below shows his tomb. The picture on the right below shows the dome above this tomb. 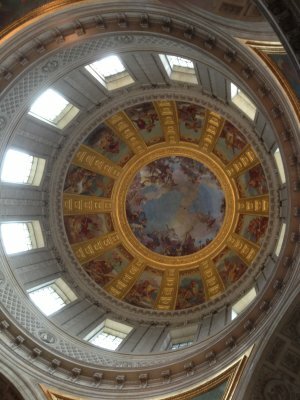 This dome is said to have inspired the architect of the Capitol Building in Washington to include the dome on the Capitol. One thing at Invalides that impressed us was a series of drawings that looked like they were originally political cartoons about Charles De Gaulle, the President of France shortly after World War II. These cartoons clearly made fun of him and his efforts to take France back to its former role as a leader in world affairs. The only thing we could surmize is that he must have angered or offended some in the military who were in a position to determine the sorts of displays that are shown at Invalides. These cartoons were clearly unflattering and outright critical of De Gaulle's views and actions toward the United States, Britain and other former allies during World War II. I had to take the picture below of the awning on one of the stores in Paris. It undoubtedly was inspired by the Washington Redskins football team. John Riggins, a Redskins running back who was a hero of one of the Super Bowls that the Redskins won, was nicknamed The Diesel because of the way he ran over people. 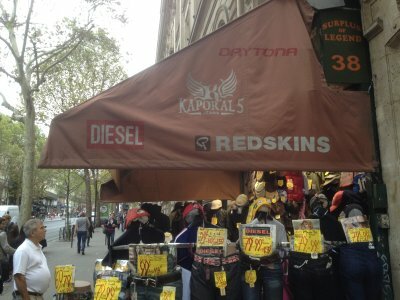 The awning has the word Diesel which undoubtedly refers to John Riggins. It would appear that the French or at least some of the French either like American football or have figured out a way to market it back to American tourists. That's Stan in the lower left of the picture. No, he didn't fall for their marketing ploy. Early Saturday morning on 15 September Stan and I boarded the Metro in Paris and headed to Gare de l'Est, one of the five train stations in Paris. Trains from this station head mostly east, toward Germany, our destination. We boarded one of the high speed trains known as the TGV (Train à Grande Vitesse) that went to Frankfurt, Germany. The trip took about 3 hours and 45 minutes including a few stops. Our car had a display that showed several things about our trip including our speed, which reached almost 320 km per hour or almost 200 miles per hour. It didn't feel as though we were going that fast. 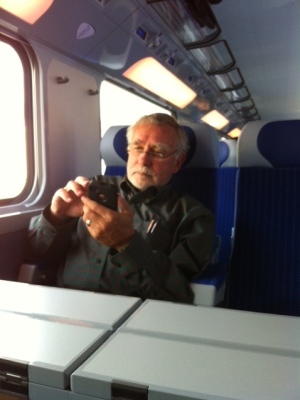 The picture below shows me on the Train à Grande Vitesse or TGV. When we arrived at the train station in Frankfurt, we discovered that our travel agent had reserved our car at the Frankfurt airport instead of at the Frankfurt train station. So we had to find another train that would take us from the train station to the airport. While we were at the ticket vending machine trying to figure out which ticket to buy and which train platform to go to, a Chinese gentleman approached us and spoke in English. He said that he had a group ticket that he could use to take people to and from the airport and would take us for the cost of only one individual ticket. He said that he was picking up friends at the airport, the reason he had bought the group ticket, and that he was happy to share the cost with us. After checking his group ticket, we concluded that it was legitimate and each paid him half the cost of what we would have paid for a one-way individual ticket. While traveling between the train station and airport, a trip of about 15 minutes, we had an interesting conversation with the Chinese gentleman. He had left mainland China years ago and settled in Germany. But he still clearly had strong interests in China. He told that there were three islands at the tip of Japan whose ownership by China had been agreed upon in an agreement between China and Japan years before World War II. After the war, the U.S. sort of treated them as Japanese property. Apparently the U.S. even negotiated a treaty with Japan over them. However, the U.S. and China never had a treaty that agreed that Japan owns the islands. And now China wants the property back. I had never heard of the issue. And I doubt that governments of Japan and the United States would give the same story or version of events that affect ownership of the islands. I think he somehow thought that we, as Americans, could somehow effect a change that China wants. He even said something like, "I know that you Americans will do the right thing." After we left him, Stan speculated that the islands are crucial to Japan's security and that was the reason the U.S. wanted Japan to have the islands after World War II. Needless to say, neither of us is in a position to collect the facts in this issue or much less do anything about it. When we arrived at the Frankfurt airport, we said goodbye to the Chinese gentleman who had helped us navigate between the train station and the airport and headed off to find the rental cars. We also wondered what the eventual outcome of the island dispute would be that the gentleman had been telling us about.